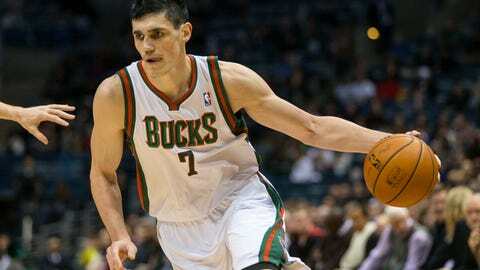 Ersan Ilyasova is averaging 8.2 points and 4.6 rebounds in 18 games this season for the Bucks. ST. FRANCIS, Wis. — Just as the Milwaukee Bucks get back up and dust themselves off after their latest injury blow, another right-handed hook seems to immediately deliver another hit to an already depleted roster. The story of the Bucks’ season continued Thursday, as two key players were ruled out indefinitely. Lingering right ankle issues caused Milwaukee to shut down starting power forward Ersan Ilyasova for the time being, while reserve guard Gary Neal’s left foot is now in a walking boot. Both will travel with the team to Cleveland but won’t play against the Cavaliers on Friday. The decision to shut down Ilyasova seemed likely after the 26-year-old struggled to walk in the locker room after playing 49 minutes in Wednesday night’s double-overtime loss to New York. "He can’t push off of it moving laterally," Bucks coach Larry Drew said. "He can’t explode off of it. The ankle is just not well." Ilyasova certainly hasn’t been himself all season long, as the sprained right ankle he suffered in the preseason opener on Oct. 8 has lingered and never really gone away. He returned for the season opener but has missed seven games due to the ankle injury. After averaging 13.2 points and 7.7 rebounds per game while shooting 44.1 percent on 3-pointers last year, Ilyasova is at 8.2 points and 4.6 rebounds per game this season and is 8-for-37 from beyond the arc. "I’ve seen it for a while just in the way he moves," Drew said. "I know having played against this Bucks team in the past in Atlanta, the things I most remembered about Ersan was how active he was, gritty, energetic, he did things with speed and a little quickness. He’s a shell of himself due to the ankle. "I know with him, he wants to be out there, but right now he’s just so limited physically with the ankle." Ilyasova’s injury leaves the Bucks with just three healthy frontcourt players after opening the season with a surplus of big men. John Henson starts at center with Ekpe Udoh and seldom-used rookie Miroslav Radujlica as the other options. Drew wasn’t sure how he’d work his starting lineup for Friday’s game quite yet. "Two of the three (big men) are going to be out there," Drew said with a laugh. Neal has battled plantar fasciitis all season and has been in and out of the lineup. He’s missed four games due to the foot pain, though Wednesday won’t officially count as a missed game due to injury for Neal because he suited up. Signed as a free agent this summer, the 29-year-old has averaged 10.5 points per game while shooting 44.6 percent on 3-pointers in 20 games this season. Reinforcements coming: The Bucks will get at least one player back for Friday and another may not be far behind. O.J. Mayo was back at practice Thursday after being away from the team since Saturday to attend to family matters following the death of his grandmother. Veteran forward Caron Butler made the trip to Cleveland and is likely to play Friday for the first time since Nov. 27. Butler has missed Milwaukee’s last 11 games with a swollen left knee. The final hurdle will be to see how the knee reacts to the flight, as Butler first experienced the swelling while flying with the team from Milwaukee to Charlotte. "It’s time," Butler said after practice Thursday. "I’ve been itching to get back on the court and wanting to play badly. If I don’t have any swelling, I don’t have pain and I can be myself, I’m going to play." Antetokounmpo starting? After his first NBA start went so well, Giannis Antetokounmpo may have earned a spot in the starting five for the time being. Drew wouldn’t officially commit to starting the 19-year-old against the Cavaliers, but it seemed likely. Antetokounmpo scored 10 points with seven rebounds while playing solid defense in Wednesday’s loss to the Knicks. "I’m thinking of doing it," Drew said. "I thought he did a terrific job (Wednesday). I’ve said it before with this kid: This is a growth process for him. There are areas that he’s going to have to experience. I thought yesterday was a big step, having him as a starter. I thought he did a really nice job and made some really nice plays. He’s getting better and better. "There are a lot of things that happened in yesterday’s game that I really, really liked. I see different ways that I may be able to use him. I thought he did a really good job just competing." Led by Carmelo Anthony, the Knicks tried to intimidate Antetokounmpo both physically and verbally. The Greek forward handled the pressure with a remarkable level of poise and even fired back at the New York superstar. "He didn’t back down," Drew said. "I don’t know what he said or if they even understood him, but I know that kid didn’t back down. One of the officials came over to me and told me he was giving both Giannis and Melo a warning because both of them were chirping at each other. That lets me know that kid has no back-down in him." Brandon Knight wasn’t surprised with how Antetokounmpo handled himself and Butler echoed those thoughts Thursday. He’s taken the rookie under his wing and seemed proud of what he witnessed. "They were just trying to intimidate him," Butler said. "I know some of the tactics I would use if I had a young guy on me. I’d do the same things or try to get away with a few cheap shots. It’s part of the game. The thing that I love about him is that he’s so passionate about what he does. I don’t think he even knows how passionate he is. He just plays hard all the time. "He’s a reflection of us. He’s my young guy. It doesn’t get to me, so it’s definitely not going to get to him." Sanders update: Bucks center Larry Sanders was at the team’s training facility early Thursday working out with strength and conditioning coach Robert Hackett. Though he’s yet to participate in an actual practice since being cleared for basketball activities, Sanders has been working out with the staff twice a day. There’s still no timetable for his return to practice, yet alone when he’ll play in a game. "He’s been working hard," Drew said. "I would like to think he’s closer, from the things he’s been doing out here. I think he’s close. I don’t know how close, but I think he’s close. I could use him." Sanders was injured in an altercation at a Milwaukee nightclub on Nov. 3 and underwent surgery to repair a torn ligament in his thumb on Nov. 11.